Bearing these thing in mind, Lois and I have fully relaunched our kayak ministry. We have been using the kayaks sporadically this past year, but now it is a more substantial part of our work once again. We originally began this service to the city of La Paz in 1995 and used it with great success until we returned to the US in 2009. The ocean has been part of our lives since childhood, and now we are being given the opportunity to give back to the Lord what he has invested in our past. This was a group of visiting pastors here for a denominational conference. It was a privilege to take these pastors out and introduce them to the beauty of Balandra Bay. The kayaking ministry works by creating large blocks of uninterrupted time in which to talk about Jesus, make disciples, do marriage counseling, teach about the value of a healthy environment, or simply offer a listening ear in a very non-threatening environment. This almost begs people to open up about their needs, desires and dreams. We currently have 8 fiberglass touring kayaks and one plastic sit-on-top plus all the necessary equipment to make paddling in the Sea of Cortez both safe and fun. We could use 3 more sit-on-tops. Our greatest need, however, is for a mid-size crew cab pickup truck. Not having an adequate vehicle is hampering this ministry by requiring that we use borrowed vehicles to tow the trailer to the launch site and back. This was the official relaunch of the sea kayaking ministry. Below are some links to videos about the kayaking ministry. Enjoy these short videos. Each kayak has a name of the fruit of the Spirit painted on the bow. In the photo above the featured boats are Patience, Love, and Goodness. I wish there was an adequate way to keep all of you, our friends and supporters, up to date with all that is going on. Facebook, SKYPE, e-mail all help, but it really is impossible to keep you current on all we would like to share with you. –Joel is very much enjoying his career in international marketing. He is doing well at it and we are grateful. – Claire is now in South America starting her Fulbright Fellowship. She will be facing a huge list of unknowns in this phase of her life. –Lois has been involved in teaching Spanish and English, helping with children’s outreaches, visiting her parents in California, and preparing to assist in a counseling ministry for survivors of abuse. The kayaking ministry which has become very sought after, as it creates so much time to spend with people (https://steveandlois.com/2016/07/28/time-to-relaunch/). We are in need of a vehicle to tow the trailer. The lack of a vehicle is severely limiting the number of people I can take out. The El Faro church where we attend needs a roof. We currently lack the funds to build. This church building lost its roof to an arsonist Our personal financial support is a bit low. Our personal financial support is a bit low. Contributions to our work can be mailed to TEAM’S NEW CONTRIBUTIONS ADDRESS. To support our ministry, please include a note stating our name or ministry project, and the amount you are giving. Thank you! This is what the kayaking ministry looks like, how it works, but most importantly WHY WE DO IT . After an afternoon kayak trip with a friend the following partial quote appeared on my page on FACEBOOK. To be successful in ministry there is really only one essential human element needed: time with people. There is not a pastor, missionary, ministry leader anywhere in the world who wouldn’t do nearly anything to create uninterrupted blocks of time to spend with people. Why do we take people out in kayaks? For only one reason: it creates those blocks of uninterrupted time during which we can encourage people and work with them to help meet their needs, be they spiritual, emotional or physical. This was our old logo on a T-Shirt. We’ll probably keep the logo but make this a ministry of El Faro church. Creates hours and hours of uninterrupted time to talk with people while we share a healthy and exciting experience. Creates conditions in which conversations flow naturally. Creates conditions where people “open up,” making counseling possible. Creates inexpensive and healthy activities for church youth groups. Creates opportunities for creation care ministries. Creates a practical link to local and state governments. Makes the TEAM missionary very visible in the community and creates an understandable identity. Creates opportunities for interns interested in missions. Makes being part of the sponsoring church better than ever. Kayaking puts us in contact with the community. This was a briefing on a beach cleanup project. The kayak fleet is available to followers of Jesus in La Paz who want to use it as a tool to share Jesus with their friends. Local schools, service clubs, youth programs, and environmental protection groups are also free to use the fleet to further their good and worthy programs. HOW CAN YOU HELP NOW? The kayaking ministry is being relaunched on a shoestring budget and with what we have on hand. To help make this ministry more effective, the following items are needed. A sturdy and reliable vehicle, preferably a mid-size crew cab pickup truck for towing the trailer. This vehicle could be donated in the US, and we would drive it to the ministry area. Kayaking gives us hour after hour to talk with people and develop freindships. Paddles, personal flotation devices (life jackets), manual bilge pumps, spray skirts, paddle floats, bailing sponges, and dry bags for gear on camping trips. One waterproof hand-held marine radio. Refurbishing the trailer: sanding, painting, protective padding. A place to store the trailer and the boats. Six small plastic kayaks to the fleet to allow grade-school children the opportunity to learn. A volunteer to create and manage a web page. Volunteers to help organize and carry out activities. We would like to replace the aging fleet slowly over the next couple of years. Some of the boats are now 20 years old and showing the stress of thousands of hard hours at sea–often paddled by inexperienced kayakers whose favorite paddling pastime seems to be crashing into the North American continent. The kayaking ministry is part of TEAM’s RANCHO EL CAMINO as an element of their adventure sports program. The church home for this ministry is the EL FARO Church in La Paz. The kayaking ministry serves as part of TEAM’S CREATION CARE ministry. Below is a short video of Balandra Bay near La Paz where we take our beginner kayakers. The focus of this video is the natural beauty of the bay and ends with the joy of sharing the experience with others. Do you remember when your small children would come home from the zoo and try to describe the day? They had so much to say and report on that they stumbled over their words, unable to articulate their enthusiasm fast enough. I feel like one of those stumble-tongued children now. There is simply no way to report all that is going on. This is the domestic violence conference put on by Emanuel, our sister church in San Jose del Cabo. • The Americas Team I lead is making solid and speedy progress in opening up new ministries in new countries with new partners. • The kayaking ministry has been relaunched. We are starting small but will see where it goes. Click this link for a fun 3.5 minute video introducing the kayak ministry. • Lois and I have decided to become part of the El Faro fellowship in La Paz. We decided to join this group of Jesus followers because of their vision – they exist because La Paz needs them and they see new and innovative ministries as a way to reach the city for Jesus. • Lois continues teaching a few classes a week at a language school in La Paz, EL NOPAL, and also meeting with our neighbors to help them with their English. She is also involved in teaching a women’s Bible study and serves as the language and culture coach for new TEAM coworkers. • New missionaries are joining TEAM – to quote one of our missionary leaders, “we are experiencing exponential growth” in the number of missionaries. This is excellent but it does mean a lot of work. There is always room for more – come join us. • We are learning what it means to physically care for a man who is dying – alone, abandoned by his family, who falls outside of any existing healthcare system, blind, incontinent. We are part of small team from El Faro who are taking care of this man while he dies. We are learning a lot – about ourselves. Joel continues to do well in his role as director of international business at his company. He was able to add a few days to a business trip recently and come for a visit. Claire is about to head to South America. She was recently awarded a Fulbright Scholarship and will be working as a teacher’s assistant at a university in South America. July 1-18 we will be in the Wheaton, Illinois area for a TEAM conference, a wedding, and some family time. We hope to touch base with many of you during those days. Grapevine, TX 76099-1986To support our ministry, please include a note stating our name or ministry project, and the amount you are giving. Thank you! This is La Paz. It is always good to come home. I’m sitting in the Mexico City airport on my way home after a trip to Honduras and Costa Rica. I spend a lot of time in this place. The purpose of this trip was to visit new TEAM folks in Costa Rica, participate in the anniversary celebration of a TEAM related church in Tegucigalpa, Honduras, and visit with and develop partnerships with sister organizations and churches. God is at work in Central America and on this trip we saw some absolutely wonderful things that made us proud to be Jesus followers. We saw churches training their own people to be the next generation of pastors and elders. We saw churches enthusiastically becoming missionary sending churches. We saw churches caring for orphans, the oppressed, the abused. We saw churches who view themselves as the tool and not the goal. We saw churches which want to grow so they can do more to help the broken world around them. We saw churches which have obviously read the last half of Matthew 25 and have learned from it and are practicing what they learned. It is an honor to be allowed to partner with these churches and become part of their team, part of their dream. My take-away from this trip? They and we need more workers, lots of them. Might King Jesus be asking you to participate in mission? This is the IMPACTO church in Tegucigalpa, Honduras.This was the Sunday morning service celebrating their 15th anniversary. They had a group of nearly the same size at their first service on Saturday night. This is an amazing church – very active in leadership development, disciple making and missions.I could talk about this church for hours; and I hold it up as an example of what a church with a vision can become. This is Project Abraham in San José, Costa Rica. It is a church which has developed an onsite orphan care project using small group homes and a day care facility for kids from troubled neighborhoods. Much of this building is made from used and re-purposed construction materials.This is one of those “wow” places. We need lots of new missionaries, thousands of them around the world. We need people who are so in love with the church they want to spend their lives building it up, either by starting new fellowships or by launching ministries which will help the existing fellowship become bigger, stronger and more effective in making Jesus- following disciples. There are countless ways to be involved in this. Write to me, and keep praying. As the Americas Team I lead becomes increasingly effective, I am hoping my schedule will lighten up a bit. If this happens, I would like to launch a secondary, part- time ministry of kayaking in La Paz. Should we start that up again? Please feel free to let us know what you think; and please be in prayer with us about this. Now that we are mostly settled back into life in La Paz, Lois is looking for her major ministry. She is involved in several things but is seeking clear understanding of where the Lord is leading. This photo is from the former sea kayaking ministry we used to run. This was a group of young people from a support group for kids whose parents had really messed up their lives. It was an effective tool for sharing the good news of Jesus, counseling and for helping people become more like Jesus. This was on the kayak outing yesterday which was led by my friend. Here the guide is giving a talk on conservation. Should Lois and I relaunch the kayak ministry? This morning during the gathering of the church with which we meet, three families asked us to relaunch the ministry. Pray with us about this. Thanks. To support our ministry, include a note stating our name or ministry project, and the amount you are giving. Thank you! 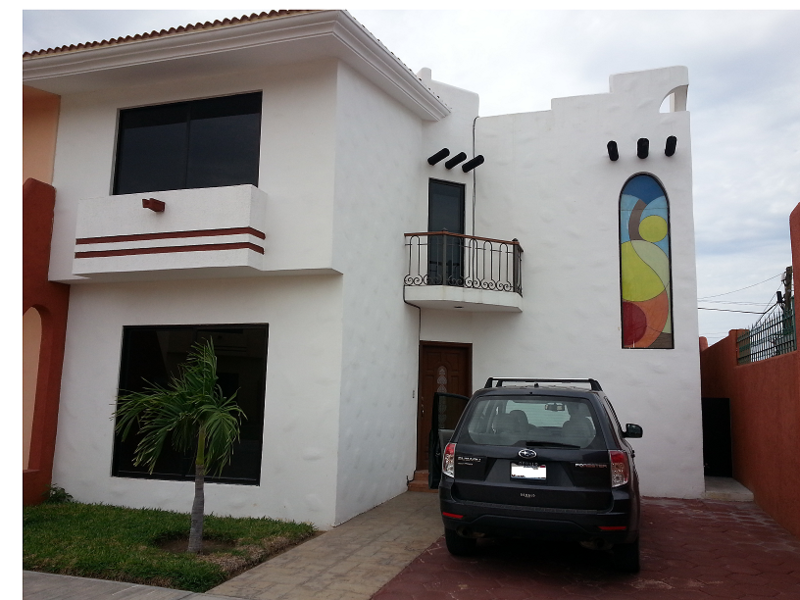 This is our new rental in La Paz.One of the keys to being a successful missionary (or a successful Christian for that matter) is getting to know your neighbors. We moved into our new rental house three days ago and are having the wonderful privilege of meeting our neighbors. We met one neighbor, Raul, when our small dachshund took on his St. Bernard and English sheep dog simultaneously in what was looking like a fight to the finish. After rescuing our dog from the jaws of death, we met and talked with our new neighbor and hopefully friend. We met our neighbor Pilar when she and we were out walking our dogs. Luis Enrique and his wife Jasmine just came by our house to invite us to a neighborhood Christmas party. We have already been made to feel welcome in our new community. Now you can begin praying that we will develop honest friendships with our neighbors which will lead to many opportunities to talk about Jesus. TEAM’s senior directors meeting in South Africa. 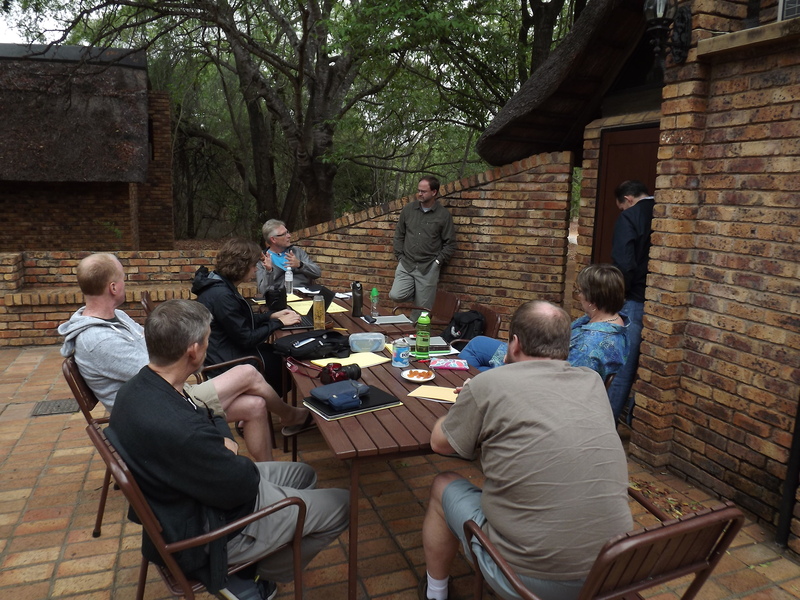 I took a work-related trip to South Africa with TEAM’s global ministry leaders. Lois has started teaching both English and Spanish in a local language school. We moved into our new rental house – shopped for appliances, contracted with an internet provider, installed curtain rods, did lots of prior house hunting. I go out to the ranch once a week to make sure things are going well during the 6-month home assignment of the ranch directors. We are getting reacquainted with old friends in La Paz – what a treat that is! I am attempting to get back to my normal senior director activities. That we quickly get an internet connection at our house (we have the contract for service but things are not moving quickly). That the Americas Team, made up of the four regional leaders with whom I work, would be used by the Lord to open up many new ministries in many new countries and that many new missionaries would join us. That the regional leader for North America would be given exceptional wisdom as he develops TEAM’s work in the US and Canada. This is a major shift in missiology as we now view the US and Canada as “receiving nations.” Not all North American Christians understand this shift yet. For our support to come up a bit since it is a tad low. Claire graduates from college on Dec. 19 and will continue the job hunting process. That Joel finds ways to serve in the church he is attending in St. Louis. Some things have not changed. The potholes may have shifted position over the years, but they are still pretty much omnipresent. We already have our old friend, a hopeless substance abuser, coming by seeking breakfast and asking “Do you have coffee? I’d like two teaspoons of sugar.” The overwhelming friendliness of the local population, the very warm welcome we have received, and the offers of help we are getting from many people are unchanged and are some of the reasons we wanted to return. One friend offered to shut down his business for a couple of hours and bring his workers over to help unload the truck with our shipment when it got here. Four families have offered to share their homes with us while we look for our own place. We also happen to have some wonderful TEAM coworkers with whom to share life and ministry. Is it any wonder we love Baja? We helped host 60+ TEAM mobilizers for one week at their annual retreat/conference. Lois co-led the worship times, and I took almost all of them on kayak outings as part of a cultural orientation workshop. Looked (still looking) for a house to rent. Resumed my work as TEAM’s senior director for the Americas . Lots of catching up to do. Finished up the required visa process. Observed young people being discipled into leadership positions in the church by the church and for the church. Begun relearning where the stores, banks, gas stations and newly redirected one-way streets are. This is the house out at the ranch. Steve will go out there once a week to check on things while the TEAM staff is in the US for six months. *We are still looking for a place to live. We are hoping for a place near the Malecon, the city waterfront. Then we have to start over with furnishing it, since we only brought Lois’s desk and one coffee table with us. *Lois will soon start teaching English and Spanish at a language school in town. *I have a trip to South Africa coming up soon. It is the annual get-together of TEAM’s senior directors. *We will be helping manage the TEAM ranch (one visit per week) for the next several months while the ranch directors are in the US. Because we have internet out at the ranch, I’ll probably do some of my senior director work out there. *We still do not know which Sunday fellowship we should join. *There are a lot of people who are encouraging us to relaunch the kayaking ministry. If we do this it will be on a much smaller scale than it was before, with probably only three or four boats instead of a dozen. Should I do this? Please pray for wisdom.